Yes another celeb has been spotted with the Rebecca Minkoff Niki tote. The lovely Vanessa Minnillo was sporting Niki in Yellow from the resort 2008 season. This is a really fun, bright (but not blinding) yellow that should work with most skin tones. It's one of the hot colors for the spring/summer season and with color being so strong all year long - even in my beloved "all-black-all-the-time" New York - you wont want to put this down once the seasons begin to turn. In fact, if you're always sporting a black coat, umbrella, pants, etc. just think of how much fun you'll have dandling this shot of color off your shoulder? It will make even the dreariest of Seattle days seam sunny and bright. The style is available at rebeccaminkoff.com. At SHOPBagTrends.com we have the Niki in Midnight Blue ($580) . It's a great textured leather that still has just a shot of color for those t hat can't image wearing the yellow. If you'd like to purchase the yellow Niki from our shop give us a call and we'll try to get it in. No promises, but we try our best for our bagistas. Also, because all her other bags have been so insanely hot hello!! almost all spring colors are sold out!! - we are now going to offer the Rebecca Minkoff Morning After Mini in yellow with silver spot for pre-order. This style is slated to arrive no later than May 15, 2008. We'll be adding it for official pre-ordering on the site in 6 weeks, but I'm posting it here to give you loyal gals so extra time. I have so much to share about my recent trip to Vegas for the WSA Collections show. As I regroup, I want to share some excited press that a wonderful new designer - Vegan Queen - just received. The below clip is the gorgeous designer Evelina of Vegan Queen on FOX chatting about Eco Luxury. I can't wait to get this line into our shop - soon I promise. I'm actually chatting with Evelina later this week to get an exact date. For now, if you see something you live just shoot us an e-mail at customerservice@bagtrends.com so we can put it on hold for you. 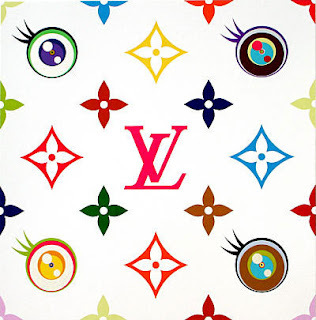 If you want to know what's hot in London, or just interested in reading a fresh, smart, cultural take on fashion check out check out what my dear friend, fabulous fashion writer and former (from many years, eehem days - has it really been so long Z?) InStyle intern Zandile Blay has to say on her blog The Blay Report. Zandile also covered London Fashion Week with her trademark wit ;) for Paper Magazine. Another must-read during your lunch break. This is totally not bag related, but exciting non-the-less. One of my favorite designers, and a living fashion icon, Diane Von Furstenberg is going to be in any upcoming American Express “Are you a Cardmember?” commercial. The spot will premiere spot during the 2008 Academy Awards show this coming Sunday, February 24th on ABC. Like previous commercials of its kind, DvF will illustrate what it means to be an American Express® Cardmember. The artistic spot opens with a collection of personal scenes around DvF's home and in her NYC studio as she reveals how through fashion, she became the woman she wanted to be. As beautiful images capture the inspirations in her life, she expresses that her role in fashion is to make women feel more confident. There will also be a print advertisement campaign, which was shot by legendary photographer Annie Leibovitz. “Women inspire me and I inspire them to be independent and free which is how I feel when I use my American Express Card,” said Von Furstenberg. “American Express represents a sign of independence and freedom and if you have your card, you can do anything." Oh, don't you just love her? I can't wait for the print ads, as I plan to clip and maybe frame them. I think that would be a nifty artistic addition to my new office. It will go right next to my Dali poster. SHOP DvF's Sping 2008 line now at Saks.com. What am I loving? PLUS, Enter for a chance to win a fashion weekend in New York and to meet Diane Von Furstenberg! Entries accepted through 3.9.08. So much going on ... lots of great scoop to share about my appointments at Elliott Lucca, The Sak, Deere Calhoun and Rebecca Minkoff's fall08 line! Plus, my adventures at Coterie trade show in NYC and plans for next weeks trip to Vegas for the WSA show. I'm working on a laptop bag story for AOL's fashion site - http://www.stylelist.com/ - and I can't tell how hard it has been to round up a selection of fashionable, computer-friendly bags. It's not like I've never shopped for this bag or written about it, but I'm really trying to find a few that are also true luxury laptop bags - not an easy task. What's a gal who loves the luxury of a Carlos Falchi crocodile tote or a new ditty from Lanvin supposed to use when she goes high tech? Tumi? No offense to Tumi, but while the quality is certainly there, there's still no feminine lux, no use of exotic skins or unique fabrics of other kinds, no wow factor. Violet May, a London-based accessories company that as they say "brings a touch of fabulousness and luxury to everyday working life." Founder Claire Collins realized, like most of us, that it's quite frustrating to find stylish, business accessories, so she decided to help herself - I mean us - out. Violet May is produced in Spain at an atelier with over 100 years of experience in the leather goods manufacturing industry. Doesn't that alone make you want to go out and buy one? I mean how many brands that have launched in the past 5 years are being produced in the fine European factories using skilled artisans and top of the line skins? Few! Trust me. Any way, enough of my babbling. Do check out the Viotet May website and you'll see why I'm raving about this brand. The prices aren't budget conscious - the featured style here is $970. But you are getting the python, the fabulous inner lining, the detailing, the craftsmanship and the pleasure of owning a truly bag-a-licous laptop bag. Between going to the fashion shows, working on assignments for various publications and running the bag-a-licious business :) I've neglected you this week. BUT, I have a great way of making it up to you. 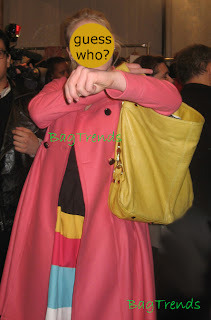 I'm going to offer 20% OFF any Rebecca Minkoff bag currently available at http://www.shopbagtrends.com/ to the bagista who can guess which celebrity (SEE FULL IMAGE by visiting the BagTrends.com magazine) was spotted wearing her bright yellow Niki bag. I'll randomly selected someone but you have to comment back with the name before Monday, February10, 2008. While my team and I are covering New York Fashion Week, back at the office we've been getting a tone of calls at SHOPBagTrends.com requesting pre-orders on the much anticipated Rebecca Minkoff Morning After Mini in tangerine - as seen on Vanessa Hudgens. So, I've decided to officially put it on the site for pre-ordering. Of course, if you want you can still place the order via phone. The bag's rich color is amazing and Rebecca's newly updated hardware (logo on all zippers - which are really strong! - and embossed logo on side padlocks) really takes the Morning After the next level. This style is expected to ship approximately March 15, 2008. For spring 2008, we'll also have the morning after mini in black with a gold crackle base and ocean blue with a gold crackle base. Then in May we'll have an amazing yellow (one of the best yellows I've seen) accented with a silver sheen leather. In March and May we'll have have the newest addition to the Rebecca Minkoff family - The Steady. For color options please call our office Monday-Fiday 9am-6pm. We're almost done with day two of New York Fashion Week and already BagTrends and I have gotten some nice press. Friday, I was photographed for StyleHive.com (ps this is not the ideal image, as it was taken from below eye levelright after the BCBG MaxAzria show sporting my Bulga Antique Pockets Bag. Not long after that, a fabulous new site - MyItThings.com - interviewed me about handbag trends and fashion week. I'll actually be judging an accessories writing contest for them so channel your inner fashion writer and post a story. It's here - NY Fashion Week Fall/Winter 2008. For the first time since I began attending I am genuinely excited to go and work the shows. I don't even mind that the weather is revolting in the city right now - it's been raining since the morning and apparently will not let out until 10PM. And even thought that meant I needed to alter my shoe choice from high healed quilted Be&D booties to very short healed Ruthie Davis boots, I'm still happy as a clam. My team (the lovely Sabrina N. -who started as my intern in July, morphed into my assistant and in a week is leaving me to become Assistant Ed. at Stylehive.com - and Paula L - the bagtrends celeb trends editor) and I are ready to hit the tents, chat with celebs, see what bags everyone is wearing and report on upcoming trends. Check into BagTrends Fashion Week Headquarters for daily updates starting tonight.